ورقه ورزقان که در بخش شمال باختری کمربند ماگمایی ارسباران قرار گرفته است، یکی از مناطق امیدبخش کانی‌زایی مس پورفیری در کشور بوده و کانسارهای مس پورفیری در رده‌بندی جهانی نظیر کانسار مس- مولیبدن سونگون را در خود جای داده است. هدف اصلی این پژوهش، تلفیق لایه‌های اکتشافی شاهد مختلف شامل ژئوشیمی، آلتراسیون و زمین‌شناسی برای مدل‌سازی پتانسیل معدنی (MPM) است. به همین منظور، در گام نخست، مقادیر پیوسته 6 لایه اکتشافی شاهد به عنوان معیارهای اصلی (نقشه ژئوشیمیایی مربوط به مقادیر PC1، نقشه‌های فاصله از آلتراسیون‌های هیدروترمال آرژیلیک، فیلیک و اکسید آهن، نقشه فاصله از توده‌های نفوذی الیگو- میوسن و نقشه چگالی گسل) با استفاده از روش فرکتال عیار- مساحت به کلاس‌های مناسب تقسیم شد و سپس لایه‌های گسسته، با استفاده از روش تحلیل سلسله مراتبی (AHP) و تکنیک اولویت‌بندی با شباهت به راه حل ایده‌آل (TOPSIS) برای تولید نقشه نهایی پتانسیل مس پورفیری در بخش مرکزی ورقه ورزقان با یکدیگر تلفیق شدند. در نهایت جهت ارزیابی توانایی روش به کار گرفته شده برای شناسایی نواحی امیدبخش در منطقه مورد مطالعه و با استفاده از رخدادهای کانی‌زایی شناخته شده، منحنی نرخ موفقیت ترسیم شد که این منحنی توانایی بالای روش ترکیبی AHP-TOPSIS را در مدل‌سازی نواحی امیدبخش مربوط به کانی‌زایی مس پورفیری اثبات می‌کند. Varzaghan district is located in NW of Arasbaran magmatic belt (AMB) which is one of the most highly mineralized region in Iran and host to a significant number of porphyry Cu deposits such as Sungun Cu-Mo porphyry deposit. The main goal of this study is synthesizing diverse raster-based evidence layers including geochemical, alteration and geological geo-data sets for mineral prospectivity modeling (MPM). For this purpose, firstly, continuous values of six favorable evidential maps as main criteria (geochemical signature of PC1 scores, values of proximity to argillic, phyllic and iron-oxide alterations, values of proximity to Oligo-Miocene intrusions and fault density) were divided into reasonable classes by applying concentration-area fractal model and then discretized layers were integrated using analytical hierarchy process (AHP) and technique for order preference by similarity to ideal solution (TOPSIS) to generate a final map of porphyry Cu potential within the central part of Varzaghan district. Finally, the success-rate curve of the AHP-TOPSIS model as a quantitative evaluation method according to the locations of known Cu occurrences was drawn. Results revealed the successful performance of AHP-TOPSIS model in portraying the prospective areas related to porphyry Cu mineralization. 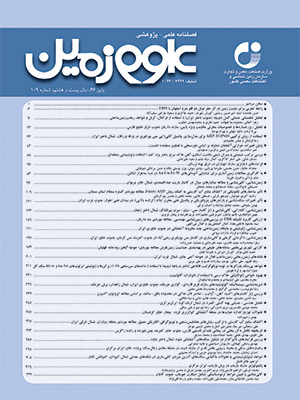 قزلباش، ر.، 1395- بررسی‌های ژئوشیمیایی و کانی‌زایی در برگه 1:100000 ورزقان، پایان‌نامه کارشناسی ارشد، دانشگاه صنعتی امیرکبیر، تهران. Abedi, M. and Norouzi, G. H., 2012- Integration of various geophysical data with geological and geochemical data to determine additional drilling for copper exploration. Journal of Applied Geophysics, 83, 35-45. Abedi, M., Norouzi, G. H. and Bahroudi, A., 2012- Support vector machine for multi-classification of mineral prospectivity areas. Computers and Geosciences, 46, 272-283. Abedi, M., Norouzi, G. H. and Fathianpour, N., 2013- Fuzzy outranking approach: a knowledge-driven method for mineral prospectivity mapping. International Journal of Applied Earth Observation and Geoinformation, 21, 556-567. Aghazadeh, M., Hou, Z., Badrzadeh, Z. and Zhou, L., 2015- Temporal–spatial distribution and tectonic setting of porphyry copper deposits in Iran: constraints from zircon U–Pb and molybdenite Re–Os geochronology. Ore Geology Reviews, 70, 385-406. Agterberg, F. P. and Bonham-Carter, G. F., 1999- Logistic regression and weights of evidence modeling in mineral exploration. In Proceedings of the 28th International Symposium on Applications of Computer in the Mineral Industry (APCOM), Golden, Colorado (Vol. 483, p. 490). Alavi, M., 1994- Tectonics of the Zagros orogenic belt of Iran: new data and interpretations. Tectonophysics, 229(3), 211-238. An, P., Moon, W. M. and Rencz, A., 1991- Application of fuzzy set theory for integration of geological, geophysical and remote sensing data. Canadian Journal of Exploration Geophysics, 27(1), 1-11. Asadi Haroni, H. A. and Lavafan, A., 2007- Integrated Analysis of ASTER and Landsat ETM Data to Map Exploration Targets in the Muteh Gold-Mining Area, IRAN. In 5th International Symposium on Spatial Data Quality, Enschede, pp. 13-15. Asadi, H. H., Sansoleimani, A., Fatehi, M. and Carranza, E. J. M., 2016- An AHP–TOPSIS Predictive Model for District-Scale Mapping of Porphyry Cu–Au Potential: A Case Study from Salafchegan Area (Central Iran). Natural Resources Research, 1-13. Ataei, M., Sereshki, F., Jamshidi, M. and Jalali, S. M. E., 2008- Suitable mining method for Golbini No. 8 deposit in Jajarm (Iran) using TOPSIS method. Mining Technology. Bonham-Carter, G. F., 1994- Geographic information systems for geoscientists-modeling with GIS. Computer methods in the geoscientists, 13, 398. Carranza, E. J. M. and Hale, M., 2001- Logistic regression for geologically constrained mapping of gold potential, Baguio district, Philippines. Exploration and Mining Geology, 10(3), 165-175. Carranza, E. J. M. and Hale, M., 2003- Evidential belief functions for data-driven geologically constrained mapping of gold potential, Baguio district, Philippines. Ore Geology Reviews, 22(1), 117-132. Carranza, E. J. M. and Laborte, A. G., 2015- Random forest predictive modeling of mineral prospectivity with small number of prospects and data with missing values in Abra (Philippines). Computers and Geosciences, 74, 60-70. Carranza, E. J. M., 2008- Geochemical anomaly and mineral prospectivity mapping in GIS (Vol. 11). Elsevier. Carranza, E. J. M., 2011- Editorial: Geocomputation of mineral exploration targets. Computers and Geosciences, 37(12), 1907-1916. Carranza, E. J. M., Mangaoang, J. C. and Hale, M., 1999- Application of mineral exploration models and GIS to generate mineral potential maps as input for optimum land-use planning in the Philippines. Natural Resources Research, 8(2), 165-173. Cheng, Q., 2007- Mapping singularities with stream sediment geochemical data for prediction of undiscovered mineral deposits in Gejiu, Yunnan Province, China. Ore Geology Reviews, 32(1), 314-324. Cheng, Q., Agterberg, F. P. and Ballantyne, S. B., 1994- The separation of geochemical anomalies from background by fractal methods. Journal of Geochemical Exploration, 51(2), 109-130. Ghezelbash, R. and Maghsoudi, A., 2018a- A hybrid AHP-VIKOR approach for prospectivity modeling of porphyry Cu deposits in the Varzaghan District, NW Iran. Arabian Journal of Geosciences, 11(11), 275. Ghezelbash, R. and Maghsoudi, A., 2018b- Comparison of U-spatial statistics and C–A fractal models for delineating anomaly patterns of porphyry-type Cu geochemical signatures in the Varzaghan district, NW Iran. Comptes Rendus Geoscience, 350(4), 180-191. Ghezelbash, R., Maghsoudi, A. and Daviran, M., 2018- Prospectivity modeling of porphyry copper deposits: recognition of efficient mono-and multi-element geochemical signatures in the Varzaghan district, NW Iran. Acta Geochimica, 1-14. Hezarkhani, A., 2006- Petrology of the intrusive rocks within the Sungun porphyry copper deposit, Azerbaijan, Iran. Journal of Asian Earth Sciences, 27(3), 326-340. Hosseinali, F. and Alesheikh, A. A., 2008- Weighting spatial information in GIS for copper mining exploration. American Journal of Applied Sciences, 5(9), 1187-1198. Hwang, C. L. and Yoon, K., 1981- Methods for multiple attribute decision making. In Multiple attribute decision making (pp. 58-191). Springer, Berlin, Heidelberg. Jamali, H., Dilek, Y., Daliran, F., Yaghubpur, A. and Mehrabi, B., 2010- Metallogeny and tectonic evolution of the Cenozoic Ahar–Arasbaran volcanic belt, northern Iran. International Geology Review, 52(4-6), 608-630. John, A. D., 2010- Porphyry Copper Deposit Model. The Book of USGS, Scientific Investigations Report 2010 – 5070 – B.
Mehrpartou, M., 1993- Contributions to the geology, geochemistry, ore genesis and fluid inclusion investigations on Sungun Cu-Mo porphyry deposit (North-West of Iran). Nykänen, V. and Salmirinne, H., 2007- Prospectivity analysis of gold using regional geophysical and geochemical data from the Central Lapland Greenstone Belt, Finland. Geological Survey of Finland, 251-269. Parsa, M., Maghsoudi, A., Yousefi, M. and Sadeghi, M., 2016- Prospectivity modeling of porphyry-Cu deposits by identification and integration of efficient mono-elemental geochemical signatures. Journal of African Earth Sciences, 114, 228-241. Pazand, K. and Hezarkhani, A., 2015- Porphyry Cu potential area selection using the combine AHP-TOPSIS methods: a case study in Siahrud area (NW, Iran). Earth Science Informatics, 8(1), 207-220. Pazand, K., Hezarkhani, A. and Ataei, M., 2012- Using TOPSIS approaches for predictive porphyry Cu potential mapping: A case study in Ahar-Arasbaran area (NW, Iran). Computers and Geosciences, 49, 62-71. Porwal, A., Carranza, E. J. M. and Hale, M., 2003a- Knowledge-driven and data-driven fuzzy models for predictive mineral potential mapping. Natural Resources Research, 12(1), 1-25. Porwal, A., Carranza, E. J. M. and Hale, M., 2004- A hybrid neuro-fuzzy model for mineral potential mapping. Mathematical Geology, 36(7), 803-826. Porwal, A., Carranza, E. J. M. and Hale, M., 2006- Bayesian network classifiers for mineral potential mapping. Computers and Geosciences, 32(1), 1-16. Pour, A. B. and Hashim, M., 2012- The application of ASTER remote sensing data to porphyry copper and epithermal gold deposits. Ore Geology Reviews, 44, 1-9. Saaty, T. L., 1990- How to make a decision: the analytic hierarchy process. European journal of operational research, 48(1), 9-26. Saaty, T. L., 1994- Fundamentals of decision making and priority theory with the AHP. Samimi Namin, F., Shahriar, K., Ataee-Pour, M. and Dehghani, H., 2008- A new model for mining method selection of mineral deposit based on fuzzy decision making. Journal of the Southern African Institute of Mining and Metallurgy, 108(7), 385-395. Yousefi, M. and Carranza, E. J. M., 2015- Geometric average of spatial evidence data layers: a GIS-based multi-criteria decision-making approach to mineral prospectivity mapping. Computers and Geosciences, 83, 72-79. Zuo, R. and Carranza, E. J. M., 2011- Support vector machine: a tool for mapping mineral prospectivity. Computers and Geosciences, 37(12), 1967-1975.